The Empress Tarot Card symbolizes prosperity, birth, love and reassurance. When she appears in a tarot reading in a favorable position she is a welcome card. The Empress can represent pregnancy or actual birth of a child however she can also represent the creation or birth of a creative project or involvement with nature. Negatively The Empress Tarot Card can signal that you, or a woman in your life, is being too protective for your comfort. She may even resort to emotional blackmail to get what she wants. Her appearance may also indicate money worries and a need to handle your finances more carefully. Another negative aspect of The Empress is that she can symbolize infertility or an unwanted pregnancy. The Empress Tarot card is a card that is used as the third trump card in the Major Arcana of a tarot deck. This card is important in any reading as it can give a person who is receiving such a reading a good idea of what to expect out of one’s life and how it is going to be run in the future. The information that is provided in this card can be rather fascinating and is always important for people to see and think about when it comes to exploring the many ways how different changes may be used in one’s life in order to get closer to enlightenment in some way. This card is symbolic of creativity, fertility and many important things relating to one’s life. It can be used in a reading to determine if a person is either willing to move forward in the world and is plentiful or if that person is depending far too much on others for all sorts of different things in one’s life. The amazing part is that it is often used as a means of helping people to understand what needs to be done in order to become enlightened. In the case of this card, much of the use of the Empress Tarot with regards to reaching enlightenment relates to the need to be a leader and to show that there is a way how others can care in some way or another. It can be a real challenge for some to work with but it is a real aspect that all need to explore. The Empress Tarot card is designed with many symbolic features on its body. The Empress is the key figure to be found on this card. She has a happy and positive look to her that suggests that there is nothing in her life that is going to change things in some way. She has a look that features some easily visible blond hair. She can be seen on the card wearing a crown full of stars. The stars are symbolic of how she is connected to the angels and fairies of the mystical world. It is as though she is looking to bring the spiritual world into the physical world. In addition, there are twelve stars on the crown, thus symbolizing her control as it is consistent throughout the entire year. A scepter can also be found in her hand. It is symbolic of how she has a sense of control over what is happening in her life. She is willing to lead others and is not someone who is going to follow far too many other people in the universe. There are a number of pomegranates that can be found on her dress. This is a fruit that is often know for being symbolic of fertility and productivity. A heart-shaped material with the feminine symbol may also be found on the seat that she is on. This symbol can be sense as a sign of femininity and the way how a woman is going to live her life while influencing all sorts of other people in an assorted number of ways. A stream can be seen right near her body as well. The stream is symbolic of her overall link with nature and the emotions that come with nature at large. The trees that are not too far from her are also symbolic of being highly influential and positive in some way. This can really make for a good sense of control over one’s life if it is used the right way. The last noteworthy physical feature of the Empress Tarot card is the large amount of wheat that can be found around the forefront of the image. The wheat is also symbolic of fertility and may show that there is some form of rebirth coming out of whatever it is one is trying to show. This can also be seen as the overall dominion or ownership that she has over the world at large and how she likes to control it for the most part. The points that are highlighted here can really be interesting to understand as the Empress Tarot card is amazingly detailed. However, if the card is reversed then it means that the person who sees the card might not have the same amount of control as anyone else might in some way. The Empress Tarot card can be interpreted as a sign of a woman’s motherly efforts and beliefs. The woman in particular is someone who creates live and creates a strong sense of influence over that life at large. She can be symbolic of the ability to create life and to really assist in nurturing the needs that many people have. In fact, it is because of this that she is often seen in some cards as someone who is pregnant. In particular, she may also be seen as the symbol of the birth of an idea. That is, an idea has been created and while it is not necessarily ready to be born just yet, it is an idea that will someday flourish and must be held for one’s future in order to really move anywhere in society at large. However, the Empress Tarot may also be seen as inferior to the Garden of Eden. That is, the Garden is the superior entity in nature and that the Empress is just a small part of what makes the Garden work as well as it should. Still, this does not mean that the Empress Tarot is someone who does not hold much control over the lives of other people. She is one who is responsible for managing the general needs that many often hold at large. 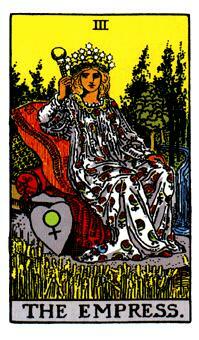 If the Empress Tarot card is upright then it means that the card is symbolic of the feminine nature of a person. This is regardless of the gender of the person who is getting the tarot reading. That is, the Empress Tarot card is a symbol of how a person is beautiful and is caring for the needs that others might have. In many cases it is also symbolic of how creative a person is. It can be a symbol of the ways how a person is going to come up with different ideas and change the world with all of these concepts at large. The information that is profiled in this card can be rather influential with regards to what a person is going to do based on relationships with other people and how they are to start. If the Empress Tarot card is reversed then it will come with a rather different meaning. In some cases it might be symbolic of a person having a creative block in some way. This means that the person is not fully aware of what one is capable of doing in life. That person may not be fully aware of the potential that one holds or is at least struggling to try and find a way to get a new idea or concept to really move forward in some way. It can be a real burden to anyone’s life but it is an aspect that need to be explored in some way. In addition, it can be suggestive that a person is far too dependent on others. That is, instead of a person being able to take care of many things that have to be utilized in some way while getting others to be reliant on one self, that person is instead being reliant on others. This can be harmful in the long run as it might make it so a person is unable to actually do things in the future in the hopes of actually being smarter and more powerful. It may be radically different from what works elsewhere but it is a real aspect of studies that can really make a difference in anyone’s life in general. These signs are reflective of how a person might need to concentrate on behaving a little differently. That is, a person might have to focus on things like taking control over one’s life and looking into new ways of doing things. In other cases it might suggest that a person is being reliant on someone that the self is not fully aware of and might need to address the points that one is dealing with. This can be rather hard for some people to accept but it is a real aspect that all people must explore and identify. The Empress Tarot card is one that is symbolic of the ways how many people are going to behave and act in their own unique forms. These are points that might prove themselves to be rather different than what one might expect but they can relate to the nurturing nature of a person or the potential for a person to be far too reliant on others. It can also be symbolic of creativity and nature. These all make for a great tarot card that may be used in all kinds of readings and has to be studied based on the many features that are found on the card.